Illustration by Brianna Gilmartin. ThoughtCo. A sonnet is a one-stanza, 14-line poem, written in iambic pentameter. The sonnet, which derived from the Italian word sonetto, meaning “a little sound or song," is "a popular classical form that has compelled poets for centuries," says Poets.org. The most common—and simplest—type is known as the English or Shakespearean sonnet, but there are several other types. 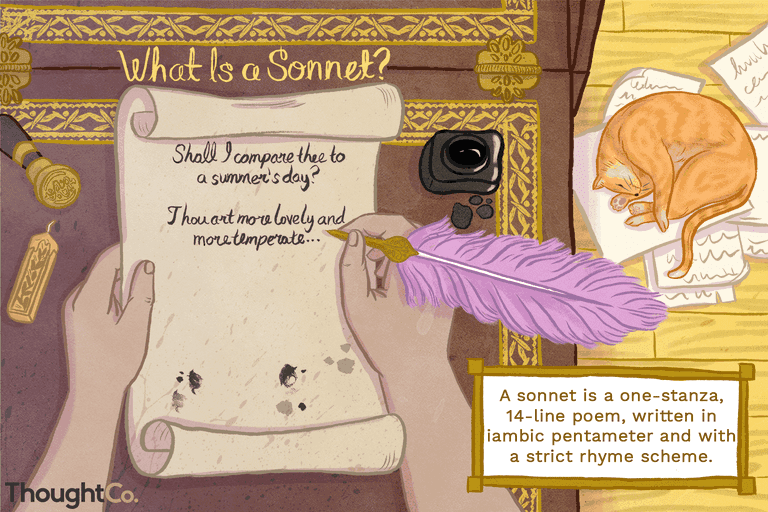 Before William Shakespeare’s day, the word sonnet could be applied to any short lyric poem. In Renaissance Italy and then in Elizabethan England, the sonnet became a fixed poetic form, consisting of 14 lines, usually iambic pentameter in English. Different types of sonnets evolved in the different languages of the poets writing them, with variations in rhyme scheme and metrical pattern. But all sonnets have a two-part thematic structure, containing a problem and solution, question and answer, or proposition and reinterpretation within their 14 lines and a volta, or turn, between the two parts. Fourteen lines: All sonnets have 14 lines, which can be broken down into four sections called quatrains. A strict rhyme scheme: The rhyme scheme of a Shakespearean sonnet, for example, is ABAB / CDCD / EFEF / GG (note the four distinct sections in the rhyme scheme). 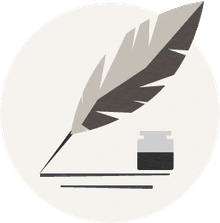 Written in iambic pentameter: Sonnets are written in iambic pentameter, a poetic meter with 10 beats per line made up of alternating unstressed and stressed syllables. First quatrain: This should establish the subject of the sonnet. Second quatrain: This should develop the sonnet’s theme. Third quatrain: This should round off the sonnet’s theme. Fourth quatrain: This should act as a conclusion to the sonnet. The original form of the sonnet was the Italian or Petrarchan sonnet, in which 14 lines are arranged in an octet (eight lines) rhyming ABBA ABBA and a sestet (six lines) rhyming either CDECDE or CDCDCD. The English or Shakespearean sonnet came later, and, as noted, is made of three quatrains rhyming ABAB CDCD EFEF and a closing rhymed heroic couplet, GG. The Spenserian sonnet is a variation developed by Edmund Spenser in which the quatrains are linked by their rhyme scheme: ABAB BCBC CDCD EE. Since its introduction into English in the 16th century, the 14-line sonnet form has remained relatively stable, proving itself a flexible container for all kinds of poetry, long enough that its images and symbols can carry detail rather than becoming cryptic or abstract, and short enough to require a distillation of poetic thought. For more extended poetic treatment of a single theme, some poets have written sonnet cycles, a series of sonnets on related issues often addressed to a single person. Another form is the sonnet crown, a sonnet series linked by repeating the last line of one sonnet in the first line of the next until the circle is closed by using the first line of the first sonnet as the last line of the last sonnet. The most well-known and important sonnets in the English language were written by Shakespeare. These sonnets cover such themes as love, jealousy, beauty, infidelity, the passage of time, and death. The first 126 sonnets are addressed to a young man while the last 28 are addressed to a woman. The sonnets are constructed with three quatrains (four-line stanzas) and one couplet (two lines) in the meter of iambic pentameter (like his plays). By the third couplet, the sonnets usually take a turn, and the poet comes to some kind of epiphany or teaches the reader a lesson of some sort. Of the 154 sonnets Shakespeare wrote, a few stand out. This sonnet best exemplifies the three-quatrain-and-one-couplet model, as well as the iambic pentameter meter. While many people assumed Shakespeare was addressing a woman, he is, in fact, addressing the Fair Youth. He compares the young man to the beauty of a summer's day, and just as the day and seasons change, so to do humans, and while the Fair Youth will eventually age and die, his beauty will be remembered forever in this sonnet. Yet who knows not, conscience is born of love? Her 'love,' for whose dear love I rise and fall." In this sonnet, Shakespeare first asks the Dark Lady to not admonish him for his sin, as she is also "sinning" with him and the Fair Youth. He then speaks to how he feels betrayed by his own body because he is merely following his base instincts, which have enslaved him to Dark Lady.